Many factors contribute to a window or door’s overall energy efficiency. The product design, the style and size of the product and the type of glass used are all variables that can affect how energy efficient a window or door truly is. At Wincore®, we’re proud to know that our windows and doors represent some of the best thinking in the industry. Key components have been outlined below. Low Emissivity glass is glass that has thin, transparent layers of metal oxide applied to the surface. This coating allows light to pass through, while reflecting heat rays and harmful ultraviolet rays from the sun. 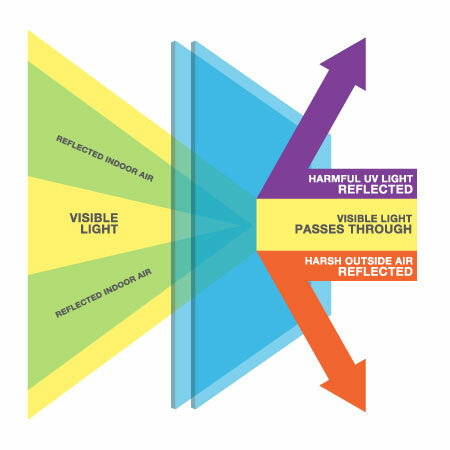 Because the Low E coating helps to control the heat transfer through a window or door, it lowers U-value ratings and increases R-value ratings. Having windows and doors with Low E glass helps to keep your home more comfortable year round by helping to keep cool, air-conditioned air inside during warmer months and heated air inside during colder months. ArgonGasMost windows and sliding doors manufactured today feature dual-paned glass. That means there are actually two pieces of glass, separated by a spacer for uniformity, inside each sash of the window or panel of the sliding door. The spacer between the panes is sealed to each piece of glass, thereby creating an air space between the two. Temperature fluctuations cause air molecules to move around and transfer heat from one pane of glass to the other. This is known as convection and can result in heat gain in an air-conditioned room in your home, or heat loss in a heated room in your home. To minimize convection, Argon gas can be used to replace the air inside the insulated glass unit.  Argon is a colorless, odorless, non-toxic gas found in the atmosphere. Argon’s molecular structure makes it more dense than air, causing it not to be affected as much by temperature fluctuations. When Argon is used to fill the insulating glass unit instead of air, it helps to reduce convection rates and thereby improves the efficiency of your window or door. 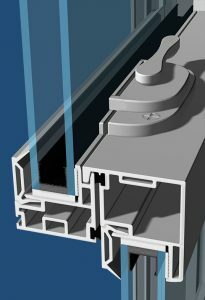 The uniquely designed U-channel spacer system adds to energy performance by helping to reduce temperature transference between the two panes of glass inside the insulating glass unit. 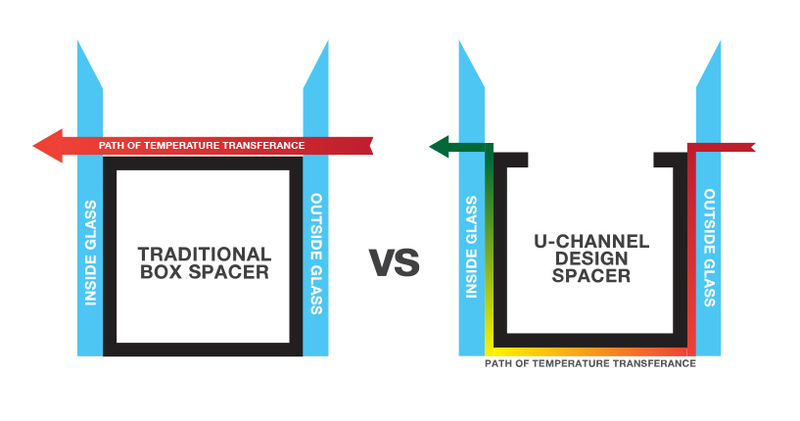 With conventional box spacers, temperature transference can occur through a direct path across the top of the spacer. This is known as conduction. Because the U-channel design eliminates this direct path and forces the transfer current down and around the spacer, the current is weakened because of the additional distance it has to travel. Adding to the insulating performance of the window and door are honeycombed chambers inside the vinyl profiles. The chambers make the vinyl profiles stronger – not allowing the profile to sag or lose shape over time. But more importantly, because these chambers are small and airtight, they act as tiny pockets of insulation around the window or door, thereby increasing the unit’s overall efficiency. To keep the edges of the glass warmer (where conduction currents originate), the insulating glass unit is set 1/2” deep into the vinyl of the sash. By keeping the edge of the unit warmer and better insulated against temperature fluctuations, it improves the the efficiency of the unit.